Did you know cucumbers contain vitamins and minerals vital for your health? First things first. Did you know cucumbers are in fact considered a fruit? No? Me either. But that's ok. Your stomach doesn't mind. Before we get into the science behind this fruit/veggie let's have some fun, watching this hilarious video that prompted me to write this blog about cucumbers. Enjoy! With B vitamins, vitamin C, copper, vitamin K, manganese and potassium, cucumbers can help you to avoid nutrient deficiencies that are widespread among those eating a typical Aussie diet. Cucumbers contain unique polyphenols and other compounds that may help reduce your risk of chronic diseases. They contain fisetin that appears to play an important role in brain health. Studies have shown that fisetin improves your memory and protects your nerve cells from age-related decline and prevents progressive memory loss and learning impairments in mice with Alzheimer's disease. Laboratory studies suggest that cucumber extract helps reduce unwanted inflammation, in part by inhibiting the activity of pro-inflammatory enzymes and, as such, they have the capacity to reduce the inflammatory response in your body. Cucumbers contain vitamin B1, vitamin B5, and vitamin B7 known to help ease feelings of anxiety and reduce the effects of stress on your body. Cucumbers contain polyphenols called lignans (pinoresinol, lariciresinol, and secoisolariciresinol), which may help to lower your risk of breast, uterine, ovarian, and prostate cancers.They also contain phytonutrients called cucurbitacins, which also have anti-cancer properties. Cucumbers contain vitamin C, beta-carotene, powerful antioxidants and flavonoids such as quercetin, apigenin, luteolin, and kaempferol that confer additional benefits to your body. Kaempferol may help fight cancer and lower your risk of chronic diseases including heart disease. Quercentin has natural antihistaminic properties. Cucumber skins contain insoluble fiber which helps food to move through your digestive tract more quickly and provide the means for a healthy elimination. 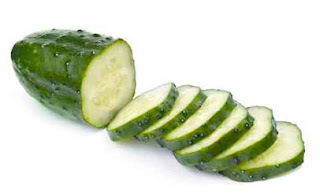 Cucumbers are very low in calories, one cup of sliced cucumber contains just 16 calories and, as such, snacking on cucumbers could be a good idea if you are interested in weight control. Cucumbers contain potassium, which is vital for your body to function properly. Potassium interacts with sodium to help control nerve impulse transmission, muscle contraction and heart function and as such is associated with lower blood pressure levels. Flavonoids and tannins in cucumber have been found to have free-radical scavenging and pain-relieving effects. As written in the Journal of Young Pharmacists: "Traditionally, this plant is used for headaches; the seeds are cooling and diuretic, the fruit juice of this plant is used as a nutritive and as a demulcent in anti-acne lotions." As you now, if you have issues with acid reflux, drinking water can help in raising your stomach pH and, as such, suppress your acid reflux symptoms; it is possible that water-rich cucumbers (95% water content) may have the same effect. Cucumbers make an ideal base for your veggie juice due to their high water content. 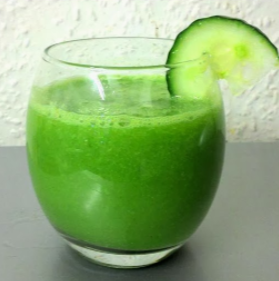 Starting your day with a simple juice of cucumber and celery is ideal for those new to juicing. From there, you can work your way up to romaine lettuce, spinach, parsley, cilantro and why not some kiwi fruit or a green apple to sweeten your day. Juice the cucumber and lime (or lemon) and kiwi (or green apple) in a juicer. To subscribe to our Recipe of the week newsletter click here.